A jury on Monday night found Pennsylvania’s Democratic attorney general Kathleen Kane guilty on nine felony counts stemming from her attempt to leak confidential information aimed at embarrassing Republican political rivals. Kane, who became a rising political star thanks to support from Bill and Hillary Clinton, has been asked to resign by Pennsylvania Gov. Tom Wolf (D.), and prosecutors say they are considering recommending prison time for Kane. "I implore Attorney General Kane to do what is right: Put the commonwealth’s residents first and step down," Wolf said. The judge, cognizant of Kane’s history of seeking revenge against political foes, allowed Kane to remain free without bail but warned her that any attempt to retaliate against individuals that testified would result in Kane being "incarcerated immediately." "There is to be absolutely no retaliation against any witness in this case, either by your mouth or by your hand," Judge Wendy Demchick-Alloy said. "If it comes to this court’s attention that has happened, you will be incarcerated immediately." Kane’s close ties to the Clintons made her an attractive choice to run against Sen. Pat Toomey (R., Pa.) in this year’s election, but those hopes were derailed in 2015 when the investigation into Kane was first made public. Kane worked on Hillary Clinton’s unsuccessful presidential bid in 2008 and then was used by the Clintons to settle their political score with President Barack Obama. Kane’s 2012 election against former Pennsylvania Congressman Patrick Murphy, who crossed the Clintons by endorsing Obama in 2008, became a battle that Bill Clinton was heavily involved in. "When Kane, the wife of a wealthy Scranton businessman, ran for attorney general last year, she benefited from a Bill Clinton political score that needed to be settled," explained Salena Zito of the Pittsburgh Tribune-Review in 2013. "[Murphy] had done the unthinkable in 2008 and endorsed Barack Obama over Hillary Clinton in the state Democrat primary … Clinton repaid that favor by fundraising, endorsing, cutting ads, and bringing out the big guns for Kane over Murphy." Kane defeated Murphy, who received help from top Obama political strategist David Axelrod, in a close election and emerged from the race as a member of the Clinton machine. 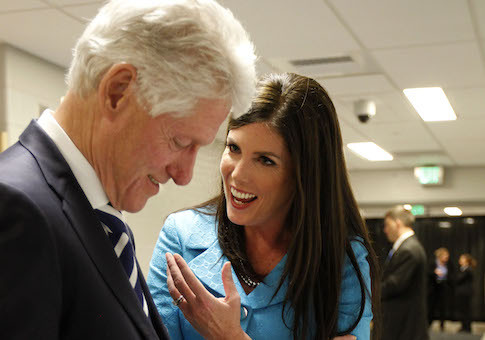 "[Bill Clinton] thereby reminded Pennsylvanians and Washington political-watchers that the Clinton machine still has big game in a big state–and that Kane was their girl," Zito wrote. Judge Demchick-Alloy says that she considers Kane to be a "flight risk" due to a trip to Haiti during the investigation. Kane will be sentenced in 90 days. Update: After this article was originally published, Kathleen Kane resigned from her position as attorney general of Pennsylvania on Tuesday. This entry was posted in Politics and tagged Bill Clinton, Hillary Clinton, Pennsylvania. Bookmark the permalink.